The South Porto Rico Sugar Company was incorporated in 1900 as a New Jersey corporation by capitalists of Muller, Schall & Co., bankers from New York City who knew about the opportunities in Puerto Rico from Edmund Pavenstedt who was one of its partners and had ownership in Central Los Caños and from their business relationship with the merchant banking firm Fritze, Lundt & Co., the largest sugar exporting firm in PR at the time. Partners in Fritze, Lundt & Co. were Karl Lundt who was the German Consul in San Juan and Henry C. Fritze who was the German Vice-Consul in Ponce. The Louisiana Planter and Sugar Manufacturer of September 14, 1901 reports; "The South Porto Rico Company is the title of a new concern organized with a capital of $3,000,000 for the purpose of acquiring 4,000 acres of lands in Guanica, on the south side of Porto Rico. A sugar factory having a capacity of 1,600 tons of cane a day is to be erected. Contracts for the equipment, which will cost not far short of $1,000,000 will be given out within the next two weeks. Hugh Kelly, of No. 71 Wall Street, is designing the sugar house." ​The crystallizers and filters came from Germany and all other equipment came from the US. Its first Operations Manager was Harry Garnett who came from British Guiana's sugar industry. Guanica came to be the second largest sugar mill in the world and the largest sugar mill in Puerto Rico, at one point processing approximately 10% of all the sugar produced on the island. In 1917 the South Porto Rico Sugar Co. ranked 349 on the list of the 500 largest US industrials. On the South Porto Rico Sugar Co. Articles of Incorporation, Henry C. Fritze was President, Julius C. Umbach, who was a member of Fritze, Lundt & Co., was Vice President and Frank A. Dillingham was Secretay-Treasurer. On June 7, 1901 the Board of Directors elected the following oficers: William Schall, Jr - President, John E. Berwind - Vicepresident, Frank A. Dillingham - Secretary and Edmund Pavenstedt - Treasurer. It elected Dillingham and Pavenstedt to serve as an executive committee in charge of PR opertations and Henry C. Fritze to serve as General Manager of the Guanica Centrale. Eventually the German-American capitalists that organized the sugar mill were replaced due to the anti German sentiment surrounding WWI and the expansion of J. P. Morgan & Co. into the sugar business. There was a close relationship between Guanica Centrale and Bankers Trust of NY itself a "House of Morgan" company. Horace Havemeyer, son of Henry Havemeyer the founder of the sugar trust, was elected to the South Porto Rico Sugar Co. Board of Directors in 1916 representing Bankers Trust. Seward Prosser, the third President of Bankers Trust from 1914 to 1923 was a Board Member of the South Porto Rico Sugar Co. from 1918 to 1922. His replacement was Albert A. Tilney (1868-1937), Bankers Trust Vice-president and President succeeding Seward Prosser who served on the Board until his death. William Schall, President of the South Porto Rico Sugar Company, was President of the American Colonial Bank of Porto Rico in San Juan which building is photographed in the Architecture page. Its expansion included the acquisition of the French company Compagnie Francaise Des Sucreires De Porto Rico in July 1908 for $1,750,000 and a $75,000 per year 15 year lease in 1910 of Central Pagán in Añasco owned by the Bianchi family. In 1911 the South Porto Rico Sugar Company acquired 20,000 acres of land in the town of La Romana in the Dominican Republic. Until 1917 when the construction of Central Romana was finished, the sugar cane harvested at its lands in the Domincan Republic was brought daily by sea and processed in Guanica. Central Romana was owned by the South Porto Rico Sugar Co. until 1967 when it was sold to Gulf+Western . As was the case with Aguirre , a "corporate" town was created around the sugar mill with homes, hospital, church and a hotel which is still in use. Having its own deep water dock in Guanica Bay allowed for easy loading of ships transporting sugar and molasses to the States. Throughout the years, the South Porto Rico Sugar Co. established a number of subsidiaries to engages in specific areas, most notably land acquisition and lease: The Guanica Land Co., Santa Rita Estate, Encenada Estate and Bernal Estate. 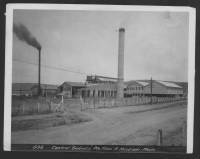 In 1917, a corporate reorganization took place that transfered the Guanica and Fortuna sugar factories and all manufacturing operations to a new South Porto Rico Sugar Co., incorporated in Puerto Rico and all the land, leases and agricultural business to Russell & Co., a partnership organized under the laws of Puerto Rico, who assumed all the business previously conducted by the Guanica Land Co., Santa Rita Estate, Bernal Estate and Encenada Estate. Despite all the efforts made to circumvent the "500 acre law", a corporate land ownership limitation contained in the Foraker Act of 1900, the South Porto Rico Sugar Co. was sued by the government in the 1930s, as were most other sugar mills on the island, when the government decided to enforce the law. As a result, the sugarcane growing aspect of the business was taken out of corporate supervision and control control of the quality and yield of the sugarcane processed was lost. In 1970, the Puerto Rico Land Authority acquired 435 acres of land in Ensenada and the sugar mill for $3,600,000 which was substantially below market value. In 1973 the Land Authority transfered ownership of the sugar mill to the Sugar Corporation of Puerto Rico who in 1977 ceased to operate the sugar refinery established in 1930. The government continued to operate the sugar mill at approximately 1/3 of its capacity until November 4, 1981 when it finally shut down. Its massive amount of machinery and equipment was sold in Guatemala, the Dominican Republic and Venezuela.